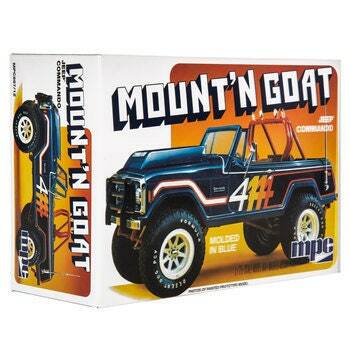 Cross boundaries with this Jeep Commando Mount’n Goat Model Kit. These Jeeps are retro and stylish, and this style is molded in blue. This kit features a lowered suspension option, Goodyear suburbanite off-road tires, three wheel options, a spare tire, tailgate supports, and more. Build this model, and show it off with other styles in your collection!